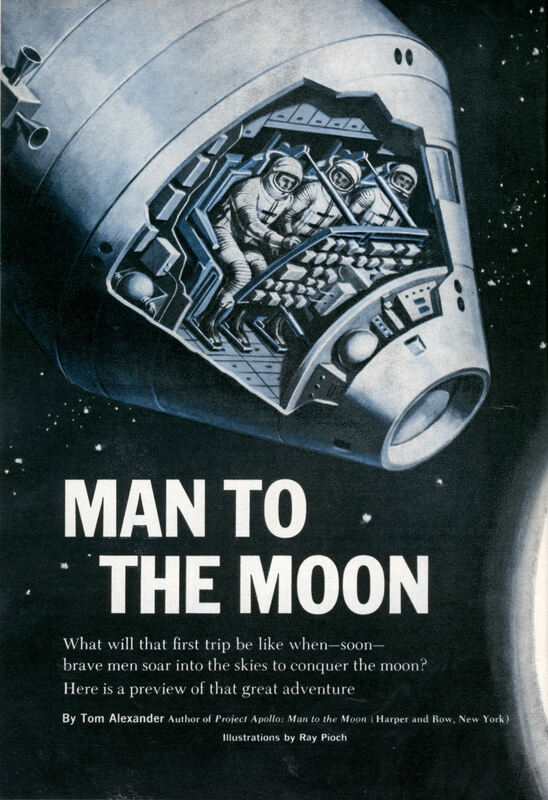 What will that first trip be like whenâ€”soonâ€” brave men soar into the skies to conquer the moon? The million-pound thrust of the second stage cuts in to spiral the astronauts outward toward their parking orbit, where the third stage burns briefly, circularizing their elliptical path. For an hour and a half the craft drifts around its orbit. The computer muses on radar data coming up from earth and resets verity into the inertial-guidance system, whose delicate sense of direction has been a little addled by the stresses of the last few minutes. Finally, while the craft passes over that side of earth most distant from the moon, the third stage fires once more. Their radiation counters crackle warningly as they soar into the inner Van Allen belt, then diminish. They have 30 minutes between the belts to tend to the LEM, to fit it tip-to-tip to the Apollo capsule. They cross past the moon’s dark western limb and brake into an orbit girdling the lunar equator. After long minutes of drifting through the darkness beside the moon, cut off from contact with the earth, the spacemen come in sight of the sun again, and shortly cross the terminatorâ€” the moon’s sunrise line. The commander and systems manager don their pressure suits and pull themselves into the bugâ€”the LENT ( Lunar Excursion Module)â€”for good. Finally, in the eightieth hour of their voyage, another countdown begins during which they open the latches on the docking attachment that has clamped the two capsules together. A brief squirt from the bug’s thrusters and the two craft drift apart. The bug tumbles over to point its engines forward along their flight path. The mains roar terrifyingly for 400 seconds, killing their orbital speed and allowing the moon’s gravity to take hold and start them downward. The craft slows rapidly to a near halt. As they tilt downward, they reduce the thrust until the rocket is roaring gently, and they are sliding along 200 feet above the moon. Their descent is made as quickly as possible and with a slight forward movement to keep them clear of the dust that begins to fountain up far below from the invisible bite of their rocket’s blast. Moving along, they write the signature of their path with an increasingly denser rooster tail of dust, until, abruptly, some 15 feet above the moon’s surface, they cut their engines and plop into the enveloping dust of the Oceanus Procellarum. THE RETURN FLIGHT The returning explorer sticks his head in through the bug’s snoutlike front hatch. He places the last labeled bag of geological samples and the photographic film on the cockpit floor and finishes hoisting himself in. The crew grinds through its last cheek-out. Now, exactly on schedule, the whine of the mother ships radio beacon comes up over the low hills to the east. As the bug climbs within three degrees of the zenith, its takeoff rocket blasts ostentatiously as it parcels out precious velocity toward careful ends. The lunar scene disappears behind a curtain of dust and fire, and the bobtailed remnant of the bug rises off its spider-legged pedestalâ€”a pedestal whose descendants could become as commonplace on celestial bodies touched by man as his 55-gallon drums have become in all the distant corners of the earth. Whirring downward from the moon, systems ticking through the 80 hours of cislunar space, Apollo winds out the final movements of the clockwork that was set in motion the instant it left earth a week before. The plan is for the craft to enter the atmosphere 400,000 feet above the Pacific, skidding on its bottom, to plunge in and briefly sample the maximum of 10 Gs and 500 degrees permitted, then to skip out to the cool of space and weightlessness before making the final plunge. In the course of that plunge, Apollo’s skin will be seared, charred, and melted, and it will emerge looking like a burned popover. Hopefully, at the right moment the slowed and sizzling capsule will tumble into the skies over the United States. At somewhere around 15,000 feet, like a whipped-cream topping, first a stabilizing drogue chute; and then the three main, slow-opening parachutes will bloom. Billowing parachutes are the happiest sight of all in the astronaut trade. Nice to knew they had it all worked out. Number 13 notwithstanding! Yeah, though 13 included, you’ve still got to admit they did a pretty amazing job of it. Actually Apollo 13 was pretty awesome just in the fact that they managed to bring them back alive even after a big explosion ripped a hole in the side of the ship halfway to the moon. The HBO Miniseries made it sound like LOR (Lunar Orbit Rendezvous) was a tough sell. I see it was selected by 1964. 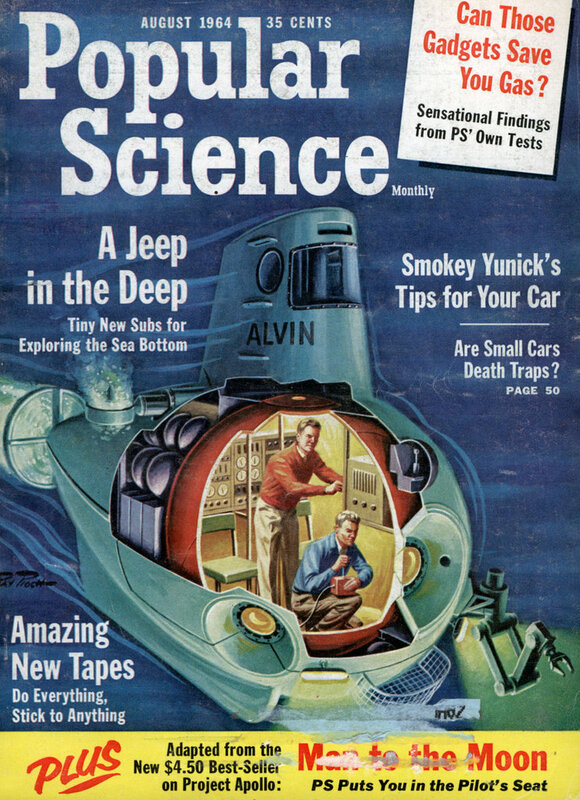 Are the Van Allen Belts really that much of a hazard? Does the US do anything with determination these days? Does the US does anything these days? No. This place became a nest of wussy after the mid-70s.